This is the first recipe I am sharing with you to help you make 2016 your healthiest year. How have you been doing? Still going strong on those goals? Starting off the day with a healthy and wholesome breakfast is key to having a productive day. These everyday toasted oats with apple crunch topping is the perfect breakfast to keep you full and productive all morning long. Plus they are easy to make and taste great. I am blessed to have two great eaters, I mean Miss E and Q love their sweets but these girls love their oats in the morning. Even Mr D is now eating breakfast regularly. The secret… toasted oats. Let’s talk about these oats. Now this is not your traditional oatmeal that your mother made you eat as a child. Toasting your oats takes this simple breakfast to a new level. 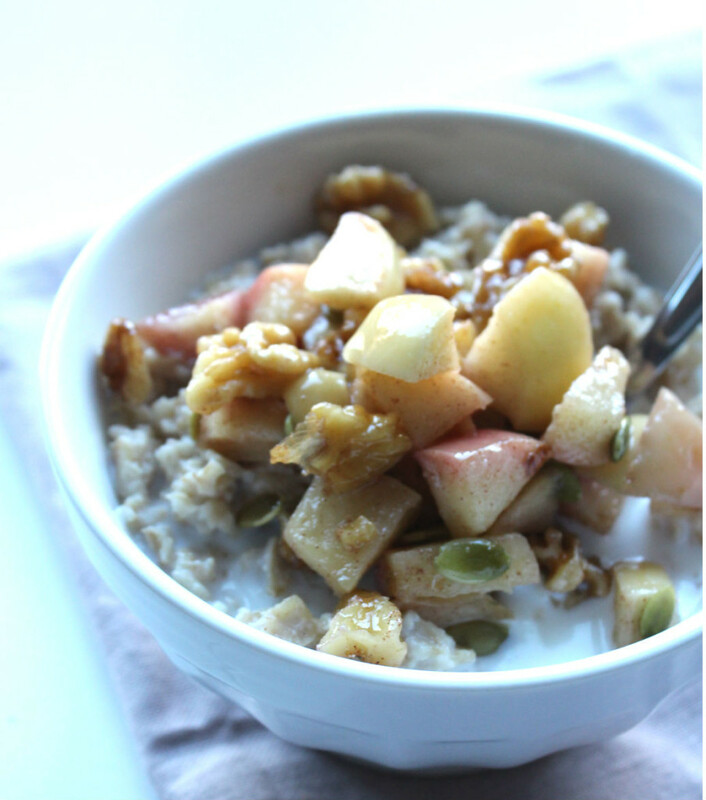 Toasting your oats brings out a delicious nutty flavour, add this healthy apple crunch topping and you have a healthy delicious breakfast full of antioxidants and fibre. If you like to press the snooze button a couple of times in the morning and time is factor, simply make a large batch on the weekend for the week. Not only do oats taste good but they are good for you! Oats are a good source of soluble fibre to help you feel full, stabilize blood sugars, and control cholesterol levels. Choosing the right oat can be a bit confusing with many varieties to choose from instant, to quick oats, to steel cut oats. When it comes to oats you need to read the ingredient list. Instant oats are highly processed and usually full of sugar, fillers like guar gum and artificial flavours. Large flake oats ( also known as old fashioned oats) are quickly steamed and rolled, like steel cut oats, have their germ and bran intact, the most nutritious part of the grain. 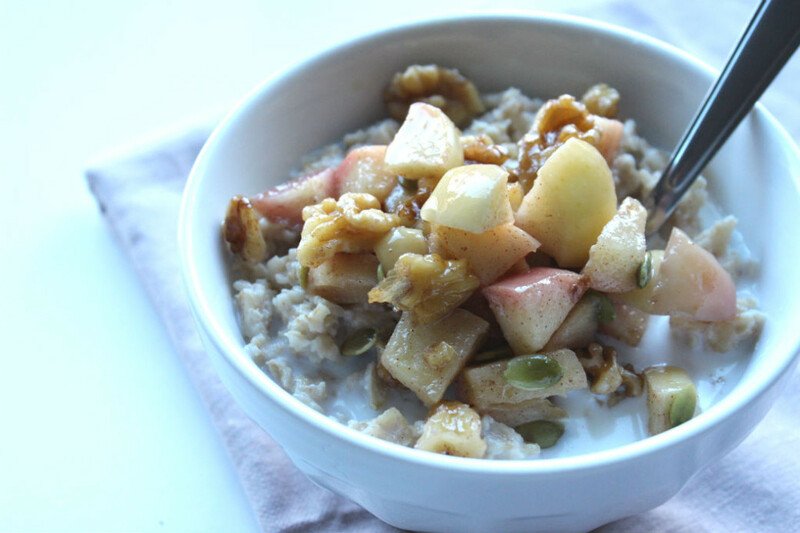 Steel cut oats are the winner when it comes to oats, they are whole grains and will keep you full all morning long, downfall they take the longest to cook. If you follow a gluten free diet you can still enjoy your oats, check the label to make sure they are pure and uncontaminated. Add milk, water, and cinnamon. Simmer over low to medium heat. Add apples, walnuts, pumpkin seeds, cinnamon, and ginger. Cook for approximately 3 minutes. Stir frequently. Add maple syrup and cook for additional minute. Add to oats. This apple crunch topping is so delicious, its like your eating dessert for breakfast and can be easily added to waffles or granola. We made it over the holidays for friends and it has a hit. The cinnamon and ginger add a subtle flavour to the apples. I leave the peel on the apples for additional fibre. According to the environmental working group apples are one of the most contaminated fruits and are recommended to buy organically if you are able. How do you lie to eat your oats in the morning?